Fractured pelvis and spine. 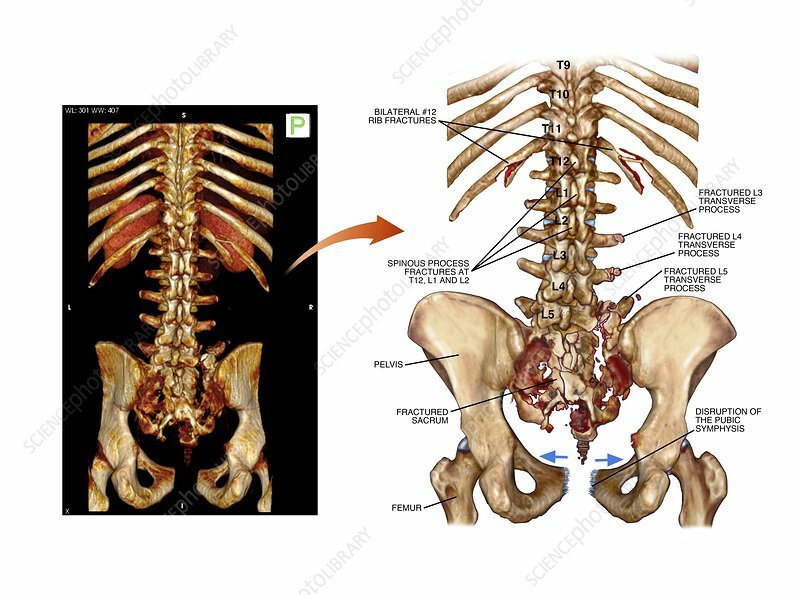 Labelled artwork and corresponding 3D computed tomography (CT) scan of a shattered sacrum, fractured vertebrae and a damaged pelvis. The sacrum is the fused bone at the base of the spine. This is a comminuted sacral fracture, with anterior pubic symphysis disruption (blue arrows). This causes the pelvis to open up like a book, hence its name of open-book pelvis fracture. This sort of injury is caused by a heavy impact to the groin and the lower spine, such as seen in motorcycle accidents. Several of the tranverse and spinous processes of the lumbar (lower back) vertebrae, and the two lower ribs, have also been fractured.